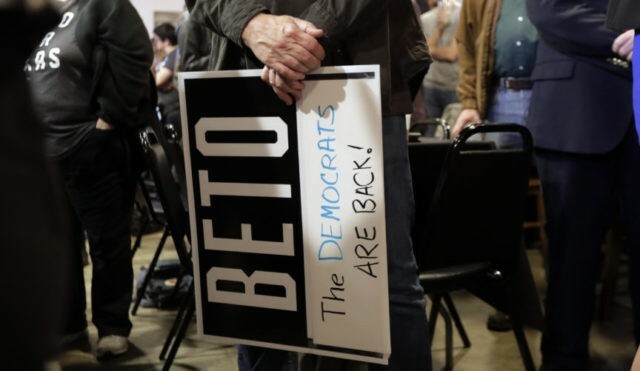 AUSTIN, Texas (AP) — Democrats in deep-red Texas turned out in the largest midterm primary election numbers in more than a decade Tuesday, propelling women candidates toward challenges to entrenched male Republicans in Congress and venting their anger at President Donald Trump in the first state primary of 2018. Neither that tragedy nor a mass shooting at a Texas church last fall played as dominant campaign issues in Texas, but with the GOP’s majority in Congress on the line this fall, Democrats came out in force. Republicans kept their edge in the total number of votes cast but Democrats made significant inroads in what had been a lopsided GOP dominance for decades. Democrats have their sights on flipping three GOP-controlled congressional seats in Texas that backed Hillary Clinton over Trump in 2016, including a Houston district where two women were the top vote-getters in early returns in a race likely to go to a May runoff. Another is a sprawling district that runs along the Texas-Mexico border, where Gina Ortiz-Jones advanced to a May runoff and another woman, Judy Canales, was battling to join her. It was also a big night for two Hispanic women, Veronica Escobar and Sylvia Garcia, who won their Democratic primaries and are poised to become the first two Latina congresswomen in a state where a population boom has been driven by Hispanic growth. College students waited more than an hour to vote in liberal Austin and rural counties offered Democratic candidates for the first time in years. A tide of anti-Trump activism helped propel nearly 50 women to make a run for Congress. Many were running in a record eight open congressional races this year in Texas — two of which are up for grabs after longtime GOP incumbents abandoned plans for re-election amid scandal. More than 830,000 Democrats had voted with ballots still being counted late Tuesday, the best showing in a midterm primary for Texas Democrats since than 1 million voters turnout in 2002, which were the first elections after the Sept. 11 attacks. Republicans were close to their turnout in previous midterms, getting more than 1.3 million votes and counting. For Republicans, the primary was a vivid exhibition of the Trump effect in GOP politics. George P. Bush, the Texas land commissioner, averted an embarrassing GOP runoff after waging a campaign in which he cozied-up to a president who once called his dad, Jeb, a pathetic person. Kathaleen Wall, a former GOP megadonor running for Congress in Houston, was also in the hunt for a runoff after she ran TV ads that suggested there was little daylight between her and Trump. Abbott will face either Lupe Valdez, who was Texas’ first Hispanic, lesbian sheriff, and Andrew White, who opposes abortion and whose father, Mark, was governor in the 1980s. In a closely-watched Democratic race, congressional hopeful Laura Moser, who moved from Washington to her native Houston wand was in contention for a runoff to challenge U.S. Rep. John Culberson. The Democratic Congressional Campaign Committee, fearing Moser would be a weak candidate in the general election, blistered her for comments from a 2014 Washingtonian magazine article in which Moser said she’d “rather have her teeth pulled out” than live in rural Paris, Texas.